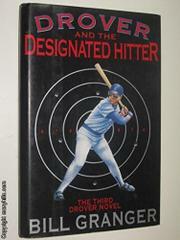  Granger's third novel about Jimmy Drover (Drover and the Zebras, 1992), ex-sportswriter turned investigator for a Vegas sports oddsmaker, throws its protagonist into the world of major league baseball. Drover is in Seattle when some muscle from Vegas insists that he look into the gambling habits of Homer White, an aging Cubs outfielder and an old nemesis of Drover's. Then White's ex-wife asks Drover to help get her former hubby traded to Seattle so that he can take advantage of the designated hitter rule to extend his career. But she has ties to a mobbed-up construction magnate with a piece of the Mariners. In short order, Drover finds himself wire-tapped by the feds, slapped, kicked, threatened, and finally shot at. In spite of some snappy writing, Granger's latest is more than a little too elaborate, although it does move at a pretty good clip.